b) Negative impact of the rehabilitation projects on the protection of the traditional urban tissue of the historic centre. March 2001: ICOMOS monitoring mission; April 2003: UNESCO/ICOMOS expert mission; May 2005: World Heritage Centre/ICOMOS reactive monitoring mission. At its 31st session (Christchurch, 2007), the World Heritage Committee noted the efforts made by the State Party and requested it to continue the revision of the Urban Development Plan and the elaboration of conservation plans for the three areas of the property, ensuring that they are coherent and complementary and include conservation policies for the traditional buildings within the historic areas of the City. The Plans should be prepared based on an assessment of the foreseeable socio-economic impacts of the conservation policies adopted by the State Party for the property on the local communities, as well as proposed mitigation measures. The World Heritage Committee also requested the State Party to share drafts of the above-mentioned plans with the World Heritage Centre and ICOMOS, before their finalisation and enactment by the competent authorities. It further requested the State Party to submit a report on the state of conservation of the property. The State Party submitted its report on 26 March 2008. It contained buffer zone modifications submitted in response to the World Heritage Committee’s decision at its 31st session in 2007, by which the World Heritage Committee referred back to the State Party the proposal for minor modifications, to allow for the rationale for the boundaries to be set out and for protection to be put in place. The revised proposals will be considered by the World Heritage Committee as a minor modification. The report provides a detailed outline of the revision of the Urban Development Plan of Lhasa and the elaboration of conservation plans for the three areas of the property. The report does not make clear whether the Master Plan for the City of Lhasa (1995-2015) is the same as the Urban Development Plan being revised or, if they are indeed two plans, how they complement each other since both appear to include regulations on the protected heritage sites. The report indicates that, at the time of its submission to the World Heritage Centre in March 2008, the Autonomous Region’s Cultural Heritage Bureau and the Chinese Academy of Cultural Heritage were in the process of formulating the conservation plans for the three sites, together with the Henan Research Institute of Ancient Architecture Protection in the cases of Potala and Norbulingka. The World Heritage Centre and the Advisory Bodies consider that it would be important that the Urban Development Plan/Master Plan and the conservation plans are developed in a coherent and complementary manner. The State Party’s report refers to protected historic sectors of the old city that are rich in ethnic tradition and culture and contain traditional structures, including Tibetan houses in which a large number of residents continue to live, as well as temples and monasteries. Further information is required about the conservation policies being applied by the State Party within these protected sectors, as well as the impacts of the conservation policies on the local communities living in these areas and elsewhere in the inscribed property. No draft of these plans has been provided, as requested by the World Heritage Committee at its 31st session. In the framework of the forthcoming periodic reporting exercise for the Asia Pacific region, the World Heritage Centre and the Advisory Bodies will be able to provide assistance to the State Party in the development of the Statement of Outstanding Universal Value for the property. 6. 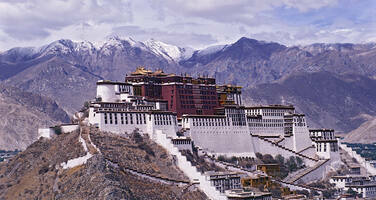 Further requests the State Party to submit to the World Heritage Centre, by 1 February 2011, a report on the state of conservation of the property for examination by the World Heritage Committee at its 35th session in 2011.
f) Submit, when completed, a copy of the revised Urban Plan for Lhasa.